In our last blog in the ‘Enabling Instructional Designers’ series, we wrote about using Raptivity as an instructional designing aid to visualize content and come up with the graphic treatment during storyboarding. Today, we will talk about using Raptivity to improve communication with subject matter experts (SMEs) and clients in an eLearning setup. When you work in an eLearning development team, you have to deal with multiple people and more often than not, you need to incorporate everyone’s ideas and feedback in your work. But most instructional designers have a specific way of putting together their storyboard. Many times, SMEs find it difficult to understand these storyboards and fail to visualize how the content will look in the actual course. Raptivity can serve as an aid to ease this situation. 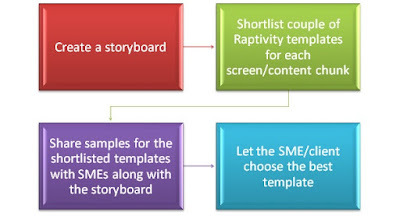 All Raptivity interaction templates follow a unique visual style and clearly indicate how the content will be displayed through each of them. 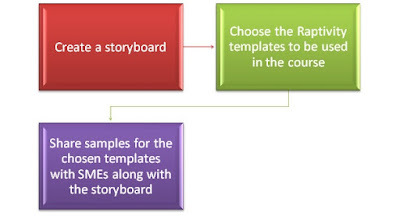 An instructional designer can make good use of these ready interactions in his/her storyboard. They may share Raptivity interaction samples (created by them previously or published default templates) with the subject matter experts or clients. They can even share the interaction or sample course links from the Raptivity website (The Raptivity website features all default interaction templates and multiple samples). Looking at these templates and samples, the SME can have a fair idea of how the content is going to look like in the course. Based on the same, s/he can share feedback with the instructional designer and the number of iterations can significantly reduce. Alternatively, an instructional designer can share multiple template options for each content chunk and the subject matter expert can choose the one s/he thinks is the best. This way they get to witness and choose from a huge variety and it also reduces alterations during the actual course development process. Interesting! Isn’t it? Did you know Raptivity could be used for these small hacks apart from serving its core purpose of course creation? Have you ever used Raptivity this way? Share through comments below.